"Haa Pastor is here, this is my last bottle of Orijin o, I am not drinking again after this"
Francis was not a pastor; he was a Christian and a God lover. All his friends noticed that he had changed since the moment he gave his life to Jesus. Many of Francis' friends were not born again yet but he was praying for them. He also noticed that they found it hard to do certain things in his presence. They wouldn't smoke cigarettes until he left, they admired his new lifestyle but they didn't feel the need to change like he did. Many things began to happen to Francis; he got an idea that tripled his income and when his friends asked him, he told them the Holy Spirit gave him the idea. Now they wanted what Francis had and gradually they all became born again and their life began to produce results. You may say to yourself, "I don't need the Holy Spirit to give me an idea, I am smart and making good money without Jesus". God built us for relationship, Revelations 4:11 tells us that we are created for God's pleasure. You may think your life is meaningful but I tell you that you are functioning below capacity if you don't have Jesus. Many people strive to make money and get to the top of their careers and make their dreams come true but then they are disappointed because it doesn't fill that inner vacuum that they thought the attainment of their dreams would fill. Many turn to drugs, to women, to religion but the wise ones turn to Jesus. 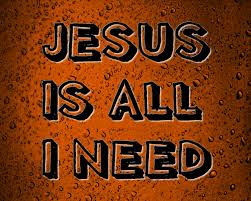 There is a part of you that only Jesus can fill and only He understands what is wrong with you because He created you. When a product is not functioning properly, we check the manual. Why are you turning to other things rather than your Creator? Come to Jesus, He holds the key to your happiness and joy. When I hear people say "I just want to be happy" what they truly need is Jesus. He will fill your heart with so much joy. Give Him a trial and you will never be the same.